Home > News > Product Knowledge > How does the New Sand Making Machine Work? How does the New Sand Making Machine Work? The new sand making machine is efficient and energy-saving equipment widely used in high-speed (high-grade) highways, high-speed railway passenger lines, hydropower stations, etc. In the leading position in the same industry, it is a high-performance sand-making machine with advanced world level. This machine is specially designed for highways, high-speed railways, high-rise buildings, municipal, hydropower dam construction, concrete mixing stations, and is the first choice for artificial sand and stone shaping. First of all, the material by vibrating feeder hopper into the new system sand machine, in the process of falling and high-speed rotating impact crusher rotor, make large stone surface, small cracks after impact of the stone rapidly accelerate, its acceleration can be up to several hundred times the gravitational acceleration, and then at the speed of 60-70 meters/seconds out from crusher rotor tangent mass ejection, and machine at the back of the first paragraph counterattack plate collision and rupture, formed the stone curtain when rebound at the same time, and later was thrown stone hit stone formation, bump material form, thus reducing the wear parts of iron loss. 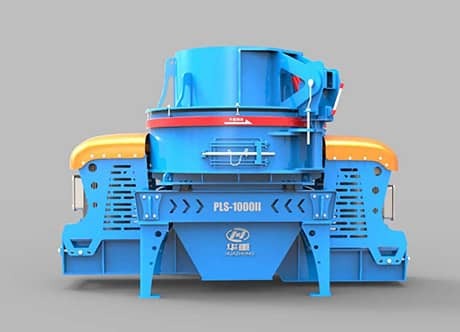 New sand making machine adopts double cavity broken concept design, so that a piece of material in the counterattack broken cavity by twice that many probability impact, friction and grinding, crushing effect composite demand gap between stone article by gas discharge was broken material is being exhausted from port bottom row material, is greater than the requirements of the stone be rotor lifting broken again, under the crushing process, the material to impact between broken, rarely direct contact with metal components, but the lining with material shattered by shock, friction, reducing the metal contamination, prolonged mechanical wear. The ingenious air circulation inside the crushing chamber eliminates dust pollution. The new sand making machine is a kind of high energy and low consumption equipment with international advanced level, which is 50% more energy saving than the traditional sand making machine. In the national market has achieved an excellent market share, product performance more perfect.